From the acclaimed author of Astrid & Veronika, a lyrical novel of two sisters bound together by a tragic moment from their past. Maria and Emma have not seen each other since their mother’s funeral two years ago. But now, Emma has come to visit Maria at her house in Spain, an unsettling intrusion on Maria’s quiet and solitary life. Over six days in the seaside town, the sisters cautiously recount the years of their separate adult lives. Their walks through the quiet town and evening talks on the terrace reveal almost more than Maria can deal with, until finally, the sisters confront their unspeakable family history. 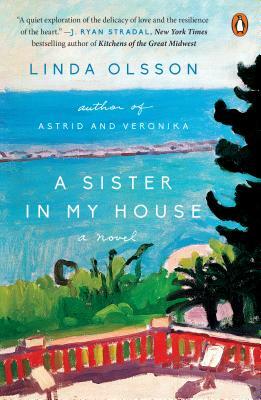 A Sister in My House is a compelling drama of grief and betrayal, but ultimately it is a story of hope and forgiveness. Linda Olsson was born in Stockholm, Sweden in 1948. She graduated from the University of Stockholm with a law degree. In 1993 she completed a bachelor of arts in English and German literature at Victoria University of Wellington. Her first novel, Astrid & Veronika, became an international success. It was followed by Sonata for Miriam and The Memory of Love. Olsson divides her time between Auckland, New Zealand and Stockholm, Sweden.